Izzie’s released a set of Face Moles and Body Moles at Izzie’s mainstore for Fifty Linden Fridays. The moles come in 3 shades for light – dark skintones. 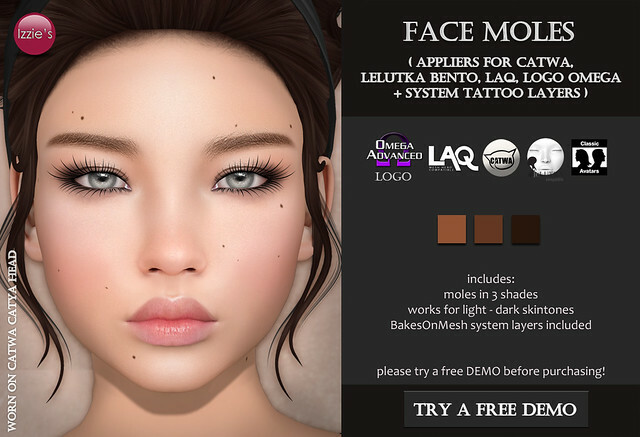 The Face Moles include appliers for Catwa, LeLutka Bento, LAQ, LOGO/Omega and BakesOnMesh system layers. The Body Moles include appliers for Maitreya, Slink, Belleza, Omega and system layers. To make sure they will work for you please try a free DEMO before purchasing! 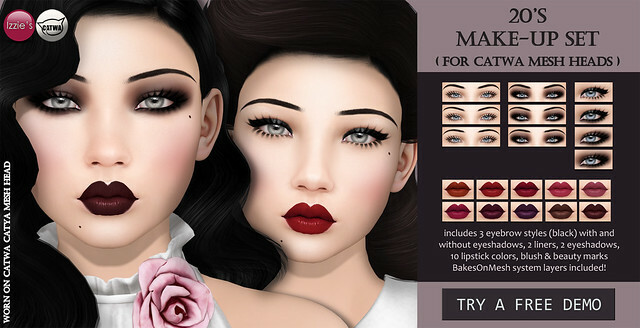 Izzie’s released Face Waterdrops for Catwa and LOGO/Omega mesh heads at Izzie’s mainstore and on Marketplace. This is an add-on set and meant to be worn with Izzie’s Body Waterdrops. Izzie’s released a set of Headshot Poses! There are 12 static poses included, intended for Close-Up pics of the avatar’s head! 3 Long-Hair Poses also included. These poses are ideal for making profile pics, pics of your hair/skin/eyes/jewelry…also perfect for vendor pics!